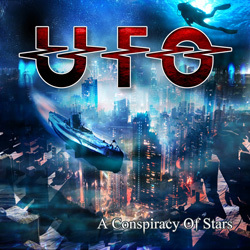 It’s hard to remember now when UFO finally managed to slip out from under the shadow of ‘Strangers In The Night’ and the halcyon – or at least, more commercially successful – days of the late Seventies/early Eighties. Such a statement alone is enough to get me burned at the stake as a heretic by the zealots, but you’d be hard pressed to deny that the band’s relationship with SPV has produced a number of increasingly exciting and thought-provoking albums, the latest of which being the intriguingly-titled ‘A Conspiracy Of Stars’. Both rousing and sublime, the first thing of note about ‘A Conspiracy Of Stars’ (the follow-up to 2012’s highly-acclaimed ‘Seven Deadly’) is that it’s the first album in a while to feature the band as they currently stand. Both ‘Seven Deadly’ and its predecessor (‘The Visitor’ from 2009) featured session bassists but this time round not only has new boy (in relative terms) Rob Da Luca settled in nicely, he’s also comfortable enough with his surroundings to contribute a couple of cuts to the running order. The second thing of note is that the songs themselves are from the heart, not the head: from the rather telling nod to ‘Should I Stay Or Should I Go’ in album opener ‘The Killing Kind’ to the dying embers of ‘Rolling Rolling’ there’s a heart full of soul in each and every composition, none more so than on ‘Sugar Cane’ which wouldn’t sound out of place on a Joe Bonamassa album. With age has come wisdom, and if in their Chrysalis years UFO had the athletic guile of an Olympic swimmer, thrashing up and down the pool and netting gold medal after gold medal, today’s band seem happy to take their time, backstroking effortlessly through the water with little left to prove. That’s not to suggest though that ‘A Conspiracy Of Stars’ is going through the motions: it’s just that after 40-odd years Phil Mogg and Andy Parker, together with Paul Raymond, Vinnie Moore and the aforementioned Da Luca have earned their freedom from expectation and/or conformity, and with this, their 22nd studio album, their maturity comes plainly to the fore. But if you’re worried that it might be all shade and no light, don’t worry: songs like ‘Devil’s In The Detail’ and ‘Ballad Of The Left Hand Gun’ keep the excitement meters in the red, and ‘The Real Deal’ is as heartening as they come. As you’d expect from a band that’s featured some true axe heroes over the years, there’s some fabulous guitar work from Moore, and as ever Mogg is on hand to offer his evocative lyrical slant on the ways of the world. What’s not to like?